If you are like me, suffering from Post-Holiday Hangover from eating lots of heavy, delicious, sugary food at Christmas...oh, and Thanksgiving....you are ready for something lighter! These quesadillas are just the ticket! I found the recipe on the updated website BeefItsWhatsForDinner.com and it is perfect! At just 450 calories per serving, with 38 grams of protein, it is a quick, easy and healthy meal than the heavy, creamy, sugary, (deliciously amazing) things I have been eating. But...remember, if you are like me, you didn't lay out the ground beef to thaw this morning and when you are ready to cook in the late afternoon, it is still frozen solid. Check out this new way to thaw ground beef! I love it! It is fast and no more cooked corners that don't incorporate into your dish quite the same. 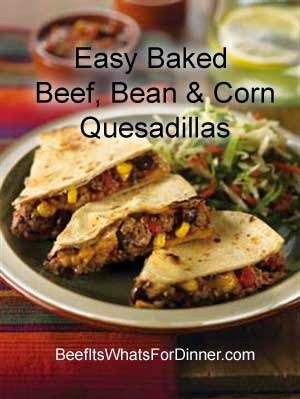 So now that we have the ground beef thawed, check out the full recipe here: Easy Baked Beef, Bean and Corn Quesadillas. And you can have a lighter and delicious meal on the table in less than 30 minutes! And while I have five kids home from college and work, fast and easy cooking is important!! I wish you all a Happy New Year and Beef it up in 2015!